“One of the Boys” is the story of an unnamed 12-year-old boy, his older brother, and his father who move from Kansas to New Mexico after they win the “war” (his father’s term for his divorce and custody battle). As they settle into their new lives, it is apparent that the boy’s father has deep seated issues, which the narrator becomes more and more aware of as the story unfolds. While the boys go to school, Dad stays in his room for days at a time snorting cocaine, shooting heroin, and doing a myriad of other drugs. Exposed to a parade of weird strangers in their home, the boys are also subject to periods of abandonment and violent physical abuse by their father. 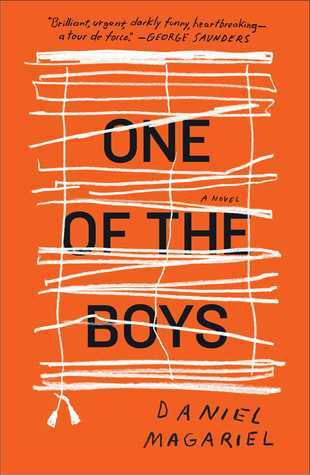 Wanting to be “one of the boys,” the narrator desperately wants his father to protect him, but as his father become more and more paranoid, he gradually loses all trust and hope. This is a nasty, brutal little book. I won’t say that it’s the most disturbing book I’ve ever read, but it comes close. There are some pretty graphic scenes here, so I would recommend reading this all in one sitting, as I did. At 176 pages its more novella than novel, though it still packs quite a punch. I thank God for this book’s brevity, as I would not continue to torture myself by going back to read it over and over had it been even 10 pages longer. P.S. – This is the third book I’ve read recently where the main characters are unnamed. While I can understand why some characters aren’t named in a story, to not give the main character one is kind of odd. Is this a trend or something? If so, I wish it would go away. Pffft.